The season-opening Paris Grand Slam 2017 concluded on Sunday with the heavyweight titans of judo as judo elite reinforced their credentials while new stars were born in the theatre of judo that is the French capital. 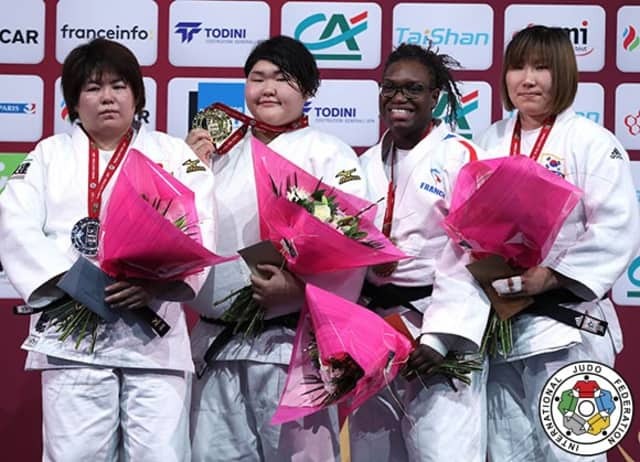 The world-famous Paris tournament, which earned Grand Slam status in 2009, was brought to an explosive finale as the women’s -70kg, -78kg and +78g categories and men’s -90kg, -100kg and +100kg categories were all contested at the AccorHotels Arena. Ahead of the final block of the opening event of the season, the IJF signed a contract with the Dutch Judo Federation to stage a Grand Prix in the Hague from 2017-2020. The Netherlands, which hosted in 2009 World Championships in Rotterdam and hosted a Grand Prix in Amsterdam in the past, will return as a destination for the IJF World Judo Tour this year. 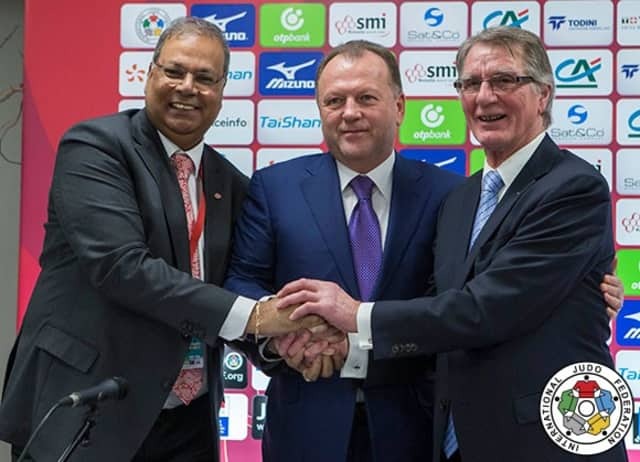 Mr. Marius VIZER, IJF President, said: “Good afternoon everyone, it is a pleasure to be here with you this afternoon at our first event of the year. Returning to the Netherlands will develop the popularity of the Dutch Judo Federation around the world and our sport and it will be a very positive experience for everyone. 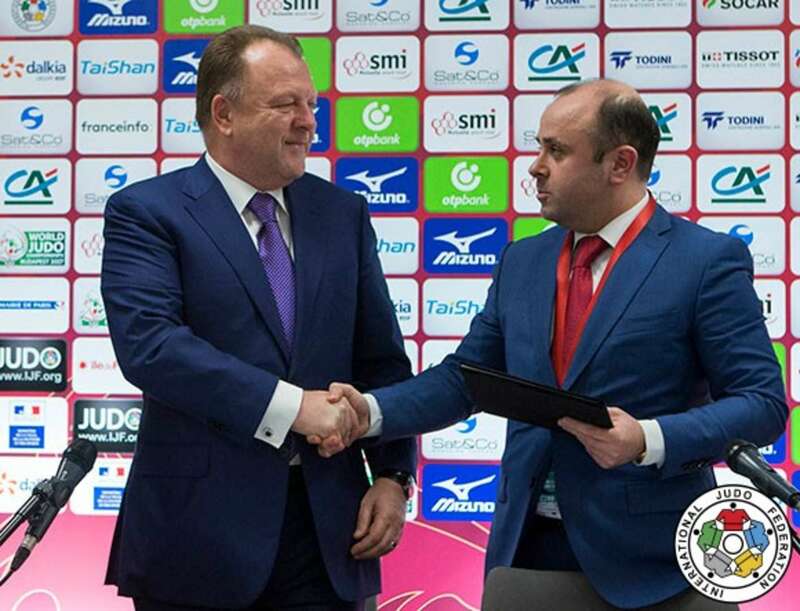 Mr. VIZER was then joined by Mr. Victor ZUBCU, Minister of Youth and Sport for Republic of Moldova and Mr. Victor FLORESCU, Moldova Judo Federation Vice President, to ink a deal with Moldova for the country to become part of the IJF Judo for Schools programme. The IJF President said: “The IJF’s Judo for Schools programme is one of our main projects and has already been developed in over 40 countries. This is our tool to develop our sport at the grassroots level and many countries are already recognising the importance of the project and its contents. Judo is a way of life and we will continue to show this to the youngest generation over the next four years as we promote our vision and hope to develop our education system in more than 100 countries. 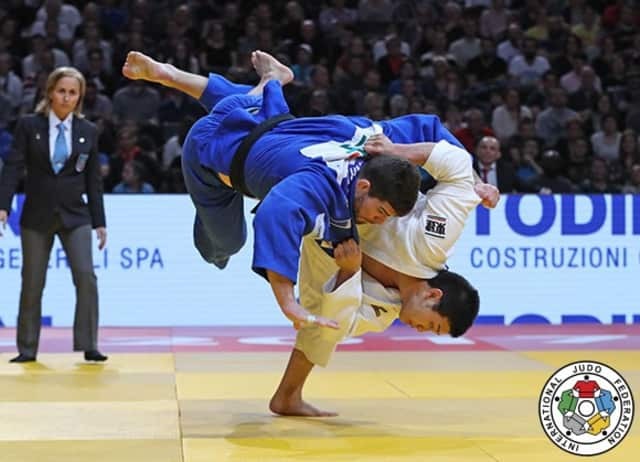 The IJF World Judo Tour now heads for Germany for the second Grand Prix of the season in less than two weeks as the best judoka in the world prepare to compete at the Dusseldorf Grand Prix from Friday 24 – Sunday 26 February. Olympic champion Lukas KRPALEK (CZE) will begin his pursuit of heavyweight gold as he moves up from -100kg to +100kg in Germany and will be intent in making an instant impact. 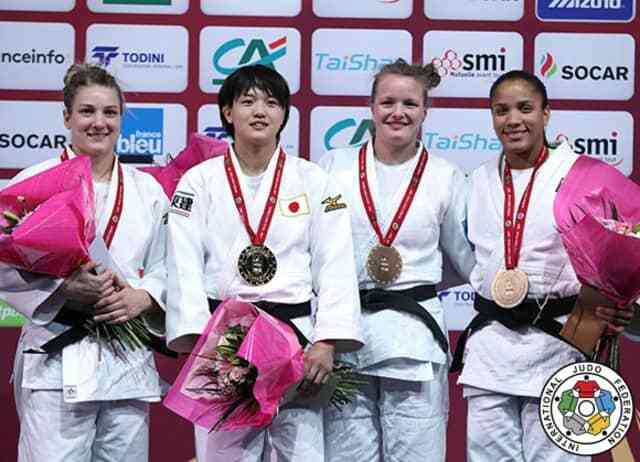 The final of the women's -70kg opposed the Tokyo Grand silver medallist, ARAI Chizuru of Japan and former world number one Kelita ZUPANCIC from Canada. The Japanese gave no chance to ZUPANCIC and with a neat turnover caught her into tate-shiho-gatame for 20 seconds and ippon, despite the instructions that double Olympic Champion, Kayla HARRISON (USA) offered from the stands to her Canadian friend. In the first semi-final ARAI was made to work hard against the fast-rising Elvismar RODRIGUEZ (VEN) who prepared for the event by working out at the IJF Training Centre in Hungary. ARAI squeezed past the Venezuelan judoka by a waza-ari while ZUPANCIC (CAN) bested YOU Jeyoung (KOR) in golden score after the South Korean received hansoku-make for a third shido. The first bronze medal was won by Sanne VAN DIJKE (NED) as YOU was beaten by ippon as the Netherlands ensured yet more hardware in France. The 21-year-old Dutchwoman rushed to her coach to celebrate capturing her first Grand Slam medal with many more expected to come in 2017. The second bronze medal contest featured RODRIGUEZ and fellow youngster Marie Eve GAHIE (FRA). These two judoka are already among the world’s top -70kg judoka at the tender ages and as they improve all signs suggest that they will be there for many Olympic cycles to come. RODRIGUEZ, who was supported to compete in Paris by the IJF, defeated GAHIE by a waza-ari to win her fourth Grand Slam bronze medal. Former world champion and two-time Olympic medallist Audrey TCHEUMEO (FRA) and Tokyo Grand Slkam winner SATO Ruika (JPN) failed to hit the heights of their performances in the earlier rounds as their tense final narrowly went in favour of the home judoka. TCHEUMEO was coached by French great Lucie DECOSSE while SATO was coached by former world champion ASAMI Haruna as both coaches were taking charge of their country’s senior team members for the first time on the IJF World Judo Tour. Golden score was required as there were no technical scores in the four minutes of contest time and a third shido against the Japanese for passivity resulted in hansoku-make and one more medal for the hosts. In the first semi-final Tyumen Grand Slam silver medallist Klara APOTEKAR (SLO) was defeated by SATO in golden score while in the second semi-final TCHEUMEO sent PARK to the canvas with a thunderous osoto-gari for ippon. The first bronze medal was claimed by number one seed Guusje STEENHUIS (NED) as the Netherlands’ medal surge on the last day continued at the expense of PARK. STEENHUIS prevailed on shido penalties to win her eighth Grand Slam medal despite having loftier ambitions when she arrived in France. 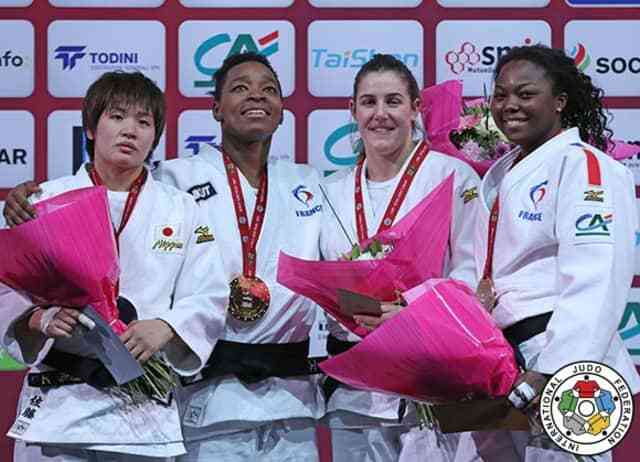 The second bronze medal contest featured APOTEKAR and Tunis African Open winner Sama Hawa CAMARA (FRA). The home fighter won an epic battle with a gargantuan effort as she held down her Slovenian opponent for 10 seconds and a waza-ari score after three and a half minutes of golden score. CAMARA, 22, improved on her fifth-place Abu Dhabi finish to the jubilation of the fantastic French supporters. World bronze medallist YAMABE Kanae (JPN) lost out to teammate ASAHINA Sarah (JPN) as the Tokai University student put herself in the driving seat for a Tokyo 2020 berth and selection for the World Championships 2017 in Budapest, Hungary. The scoreless contest came to a conclusion when YAMABE received a third shido for passivity and hansoku-make. ASAHINA, who started judo at the Kodokan and still lives around the corner from the traditional home of the sport, was supported by her parents in Paris and can is already fulfilling their hopes and dreams with this result just the beginning for the 20-year-old. In the first semi-final Rio 2016 Olympic champion Emilie ANDEOL (FRA) was stunned by ASAHINA Sarah (JPN) who overpowered the French judoka with alarming ease in 53 seconds for a place in the +78kg final. In the second semi-final YAMABE Kanae (JPN) defeated Eva BISSENI (FRA) to book an all-Japanese final. The first bronze medal was claimed by Asian Championships winner KIM Minjeong (KOR) by the margin of a waza-ari against Eva BISSENI (FRA) after four minutes. The second bronze medal contest was won by ANDEOL who recovered from her semi-final loss to deny KALANINA (UKR) in golden score by a shido. Abu Dhabi Grand Slam bronze medallist Frank DE WIT (NED) won his first Grand Slam gold medal as the Netherlands have the ideal poster boy for their new Grand Prix at The Hague which was announced on Sunday. 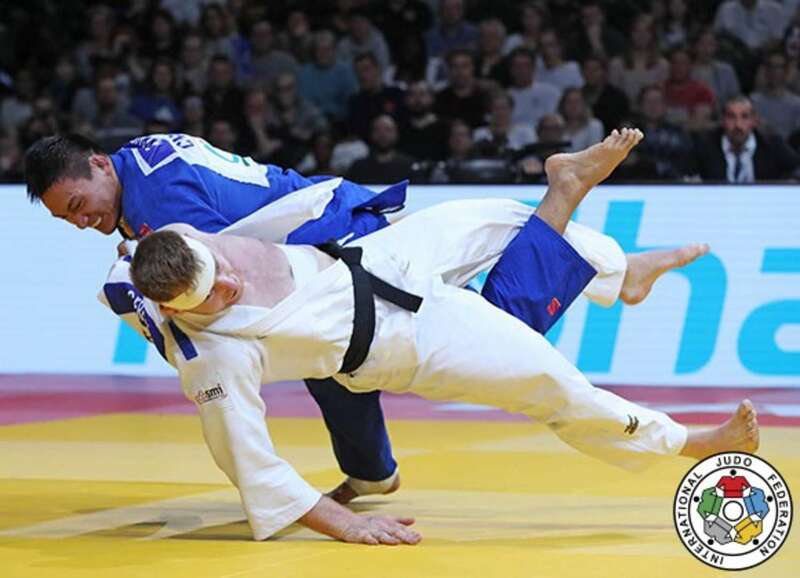 Both judoka cancelled each other out in regulation time and needed an additional 54 seconds to be separated by a waza-ari score which went in favour of the 21-year-old Dutchman. In the first semi-final REKHVIASHVILI saw off Pape Doudou NDIAYE (FRA) by a waza-ari while in the second semi-final Eduardo Yudi SANTOS (BRA) lost out to DE WIT by the same score. 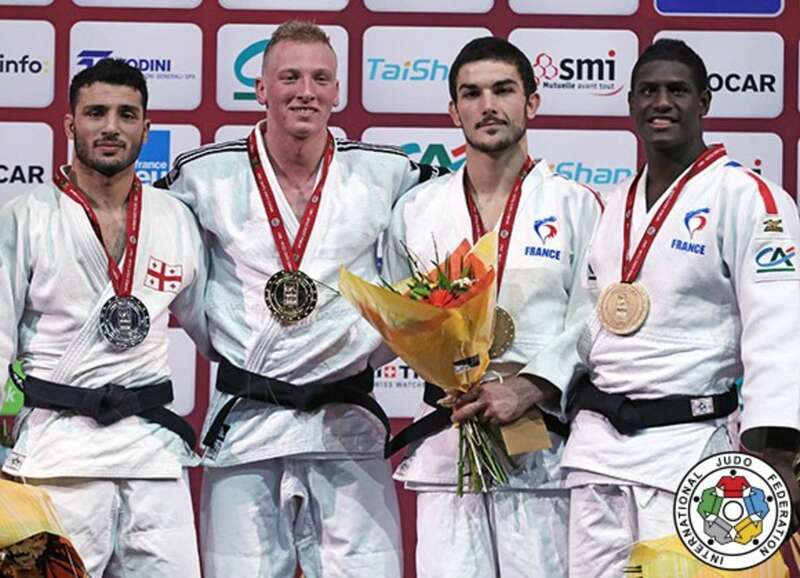 The first bronze medal was clinched by 21-year-old Grand Slam debutant Baptiste PIERRE (FRA) who gave the hosts an ideal start to the final block with a victory over SANTOS by ippon. The second bronze medal was won by world number 115 NDIAYE who produced two scores in the final minute as he came from behind to beat world number 113 HONG Suk Woong (KOR) who finished fifth at the Tokyo Grand Slam in 2013. The home judoka trailed to a waza-ari as the contest entered the final 60 seconds but NDIAYE level the contest with a waza-ari with 40 seconds left and then countered the fading South Korean for ippon with five seconds left. Rio 2016 Olympic bronze medallist CHENG Xunzhao (CHN) showed this Olympic heroics were not down to goof fortune as he performed just as well in Paris to win his first Grand Slam gold medal. CHENG, who was unseeded and unheralded going into the Games, had a Qingdao Grand Prix gold medal from 2012 to his name until Rio 2016. 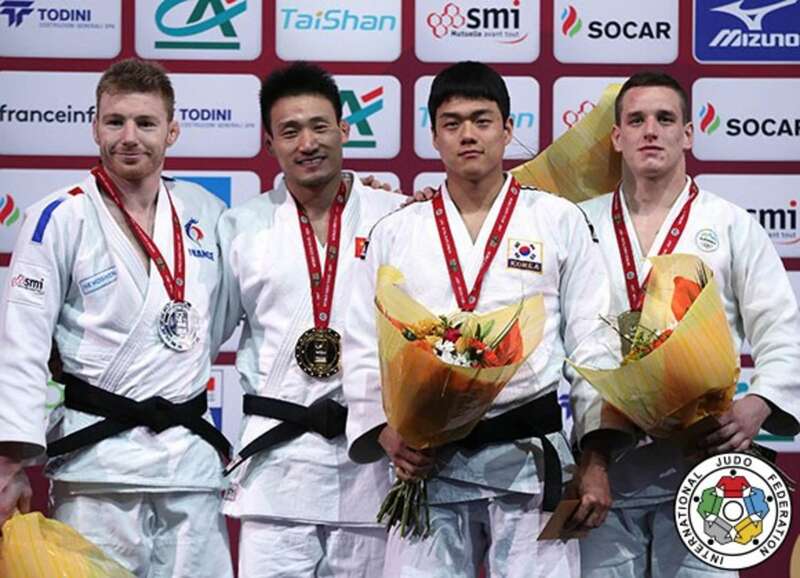 The Chinese revelation is now one of the latest and most exciting stars, as the ippon artist threw Tokyo Grand Slam silver medallist Axel CLERGET (FRA) for ippon in golden score to take home gold. In the first semi-final CLERGET defeated Mihael ZGANK (SLO) after one minute of golden score by a waza-ari while in the second semi-final world champion GWAK fell to CHENG Xunzhao (CHN) who held down the reigning champion with a kami-shiho-gatame for 20 seconds. The first bronze medal was won by world champion GWAK who denied Paris debutant and Qingdao Grand Prix winner Max STEWART (GBR) a medal for his gutsy effort by ippon. The second bronze medal went to ZGANK as former World Judo Masters winner Beka GVINIASHVILI (GEO) received a shido in golden score bolster Slovenia’s medal tally in Paris. 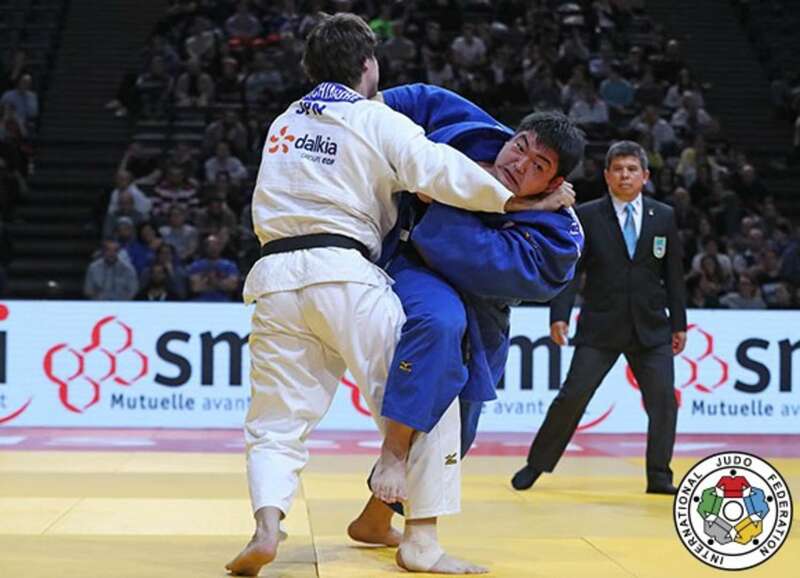 Tokyo Grand Slam bronze medallist IIDA Kentaro (JPN) impressed for Japan as he had the measure of Rio 2016 Olympic bronze medallist Cyrille MARET (FRA) – a three-time Paris winner – with a masterful display beyond his years. IIDA, who has been dubbed the ‘new Inoue’, did perform a breathaking uchi-mata in the final to give more credibility to that claim, as his beautiful waza-ari was the only score of the contest. IIDA, 18, can now expect a call-up for the Japanese worlds team in August and may add some seasoning to his skills with domestic and international engagements this spring. MARET is still on the best medal run of his career and will be eying a rematch against Japan’s new starlet at the earliest opportunity. In the first semi-final Jorge FONSECA (POR) was surprised by new boy IIDA Kentaro (JPN) who threw the Portuguese powerhouse – who had lit up the prelimairy rounds – with an uchi-mata out of nowhere for ippon with 24 seconds remaining having trailed to a waza-ari. In the second semi-final MARET beat KORREL by a waza-ari tafter four minutes to bring the Bercy crowd to their feet. The first bronze medal was won by -100kg newcomer Varlam LIPARTELIANI (GEO) who made a confident start to life in the heavier weight category with a determined display that ended with a narrow win over Michael KORREL (NED) by a waza-ari. The second bronze medal went to Jorge FONSECA (POR) who threw for a waza-ari before holding down Grigori MINASKIN (EST) for 20 seconds and ippon. Double world silver medallist SHICHINOHE Ryu (JPN) toiled to silver as he was marginally outworked by Tokyo Grand Slam winner OJITANI Takeshi (JPN). 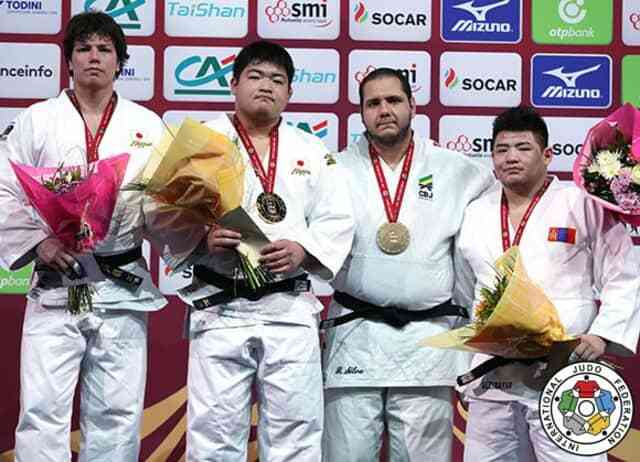 SHICHINOHE had won their previous two IJF World Judo Tour meetings, but has been under pressure after numerous defeats to Teddy RINER as Japan bid to find a heavyweight who can defeated the French master. A third and final shido for SHICHINOHE handed the gold medal to Tokai University’s OJITANI as his domestic and international rival’s star appears to be waning. In the first semi-final SHICHINOHE defeated former Junior world champion ULZIIBAYAR Duurenbayar (MGL) after 35 seconds of golden score by osaekomi. In the second semi-final OJITANI confidently defeated double Olympic bronze medallist Rafael SILVA (BRA) in golden score by ippon. 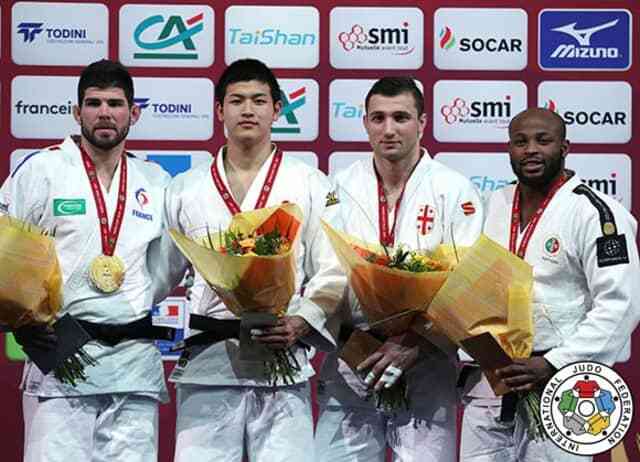 The first bronze medal was won by SILVA over Harun SADIKOVIC with a typically forceful drive for ippon. The second and last bronze medal contest saw ULZIIBAYAR hold down Guram TUSHISHVILI (GEO) with a yoko-shiho-gatame for 20 seconds and ippon.